A few weeks ago I was given the opportunity by Canon to try out their new EF 200-400mm f/4 L IS USM lens with an internal 1.4x extender. I gave the lens a good test drive shooting a college basketball game and an NFL football game. My bread and butter lens for shooting sports is a Canon 400mm F2.8, but I was intrigued by the zoom range of this lens and the fact that it’s a little smaller and a little lighter. I didn’t think the built-in 1.4 extender would be that big of a deal, but after shooting football with it, I came to love it. The Canon EF 200-400 F4 is the first SLR lens with a built-in extender. With the extender, your shooting range is 280 – 560mm at 5.6. The aperture stays the same throughout the zoom range of the lens. The lens also has built-in image stabilization that claims it gives you a four stop benefit. The weight difference from the 400mm F2.8 I shoot with was noticeable. My 400mm is the version before the current one, so I would go from an 11.83 pound lens to 7.91 pound one if I switched to this lens. The new version of the 400mm F2.8 is lighter than my 400mm at 8.49 pounds. 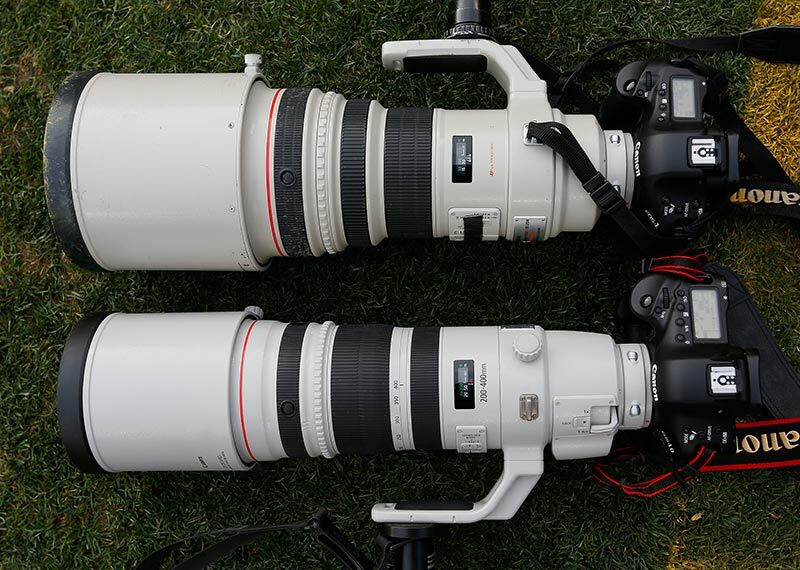 The current Canon 400mm F2.8 and the 200-400 are about the same price in the 11-12k range. Nikon’s version of the 200-400 is about 4k less than the Canon version and is a half pound lighter, but doesn’t have a built-in 1.4 extender. I have a number of friends that shoot with the Nikon 200-400 and love the lens. Before the current version of DSLRs, I might have been reluctant to buy a super telephoto lens with an F4 aperture, but shooting even at 6400 ISO with my Canon 1D X produces very usable images. For both of the sporting events I photographed with this lens, I shot wide open. For basketball, I shot at 1000th of a second, F4 at 6400 ISO. I didn’t need the additional range of the extender for basketball, so I never engaged it. For the NFL football game, I had some quickly changing lighting conditions from backlit with a deep shadow background to flat low contrast light when clouds popped in. I shot the football game at auto ISO with a fixed shutter sped of 1600th of a second. I like to shoot football at a little higher shutter speed than some photographers. I would say my ISO ranged from 400 to 3200 throughout the day. Engaging the 1.4 extender is as simple as flipping a lever at the base of the lens. The day I was shooting football, I wore gloves for about half the game; flipping that lever was easy to do even with gloves. I even found myself engaging the extender during plays that moved rapidly towards or away from me. I usually switch away from my 400mm lens when the ball gets within the red zone and pick up my 70-200 that I have on another camera body at my side, but with this lens I was able to let the ball get even closer to me before I picked up the 70-200. I usually shoot from the middle of the north end zone when covering games at Lambeau Field with another member of my team covering from the south end zone; even if the ball is all the way on the other end of the field, I will shoot down the full length of the field to get an opposite look at the action. With the 200-400, I really felt like I could cover that entire area well. I had one long throw from mid field go to the corner of my end zone and I was easily able to zoom the lens from the 400mm it was at for the snap of the ball to the 200mm I wanted for the pass into the corner of the end zone. If I was shooting with the 400mm, I would have had to quickly pick up the 70-200 (and I’ve done that many times), but staying with the same lens lets you easily track the action. If the pass would have been to the middle of the end zone, the 200mm would probably have been too much lens. I see this lens as an outdoor sports and nature photography lens, but I still wanted to try it out at a basketball game. For this game, my main shooting responsibilities were to get some isolated action shots of a few players, coaching staff and photos of a seven foot tall player blocking shots. I did miss out on a few dunks because I was over lensed. My 70-200 F2.8 is my go-to lens for basketball games and the lens I will stick with if I’m covering a game as a journalist, but the 200-400 wouldn’t be a bad lens to take to the occasional basketball game to change things up. 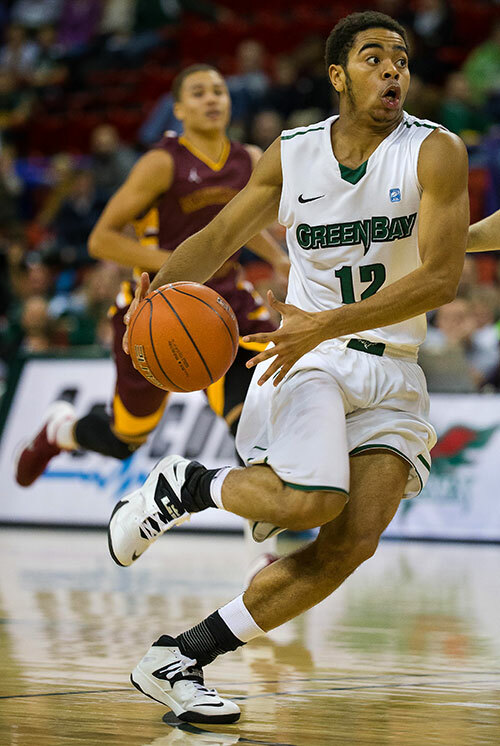 I talked with Morry Gash, a staffer with the Associated Press and an early user of the lens, and he plans to cover some basketball games with just the 200-400 and a remote with a shorter lens mounted to cover action under the basket. I shot the lens handheld for basketball and that worked out great for me, but I wouldn’t want to shoot multiple games in a day with it unless I had a really strong back. For football, I shot with a monopod. If I were buying all my camera gear today, I would strongly consider buying the 200-400 F4 over a 400mm F2.8. I’m used to shooting with the 400, but I really loved this lens and the built-in 1.4 extender. I think the 200-400 would be an excellent lens to cover golf, tennis, track or even sailing. I pull out my 400 for the occasional transportation photography shoot of a truck on a long road; I could see the 200-400 being a great lens to track a vehicle with as it got closer to you. If money was no object. I would buy this lens. But until I can justify replacing my 400 F2.8, I will stick with that lens and be envious of those that already have it. I thought the 200-400 was every bit as sharp as my 400, but one thing I did find and I also read about in other reviews is that you get a little vignetting when shooting wide open with the extender engaged. Another thing I wish they could have done, but isn’t a deal breaker on the lens, is that to zoom from 200 to 400, you wouldn’t have to turn the zoom ring as far. That wasn’t as big of a deal when shooting football, but when shooting handheld at a basketball game, it was a bit of inconvenience. The lens also has what’s called power focus, makes it possible to produce a very smooth and controlled focus pull from one focus distance to another when shooting video. Canon started putting this feature in some of it’s lenses a few years ago. So that’s my review on Canon 200-400mm zoom lens and here a few photos of the lens and some shots taken with the lens. 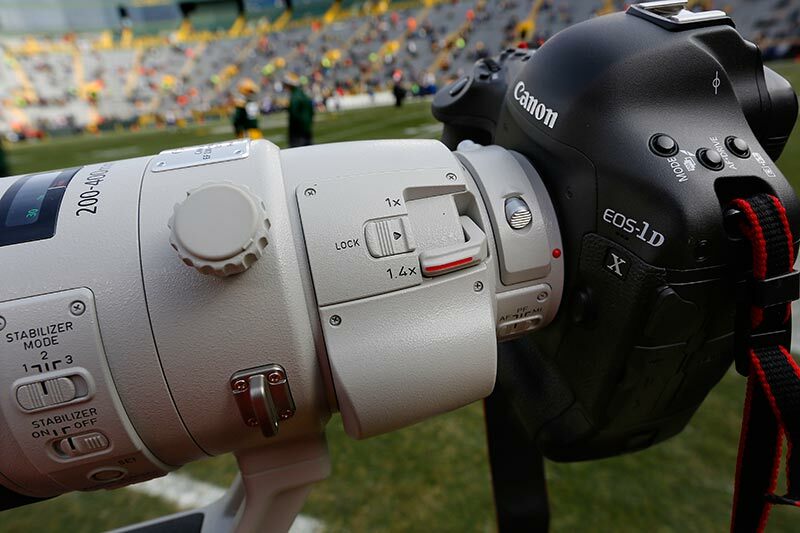 You can also see my game day blog from the NFL game I shot with this lens at this link. My current Canon 400mm F2.8, at top, next to the new Canon EF 200-400mm f/4 L IS USM. The lever that will engage the 1.4 extender on the lens. 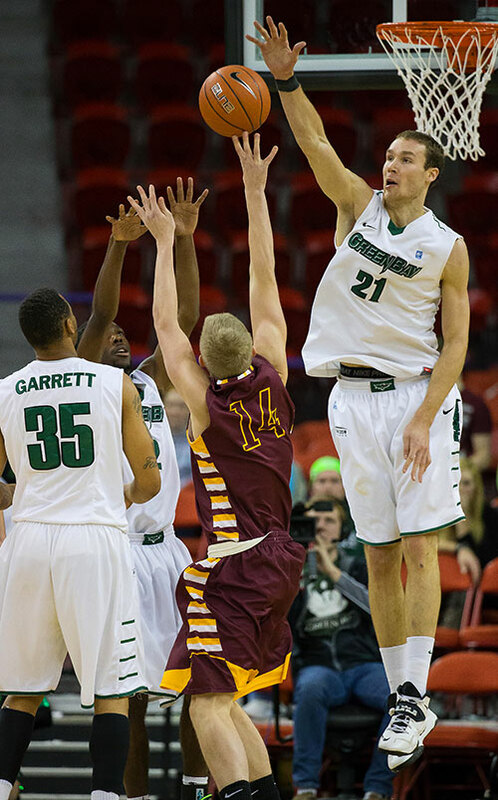 Shooting down court at basketball allows you to cover the action like this block shot. 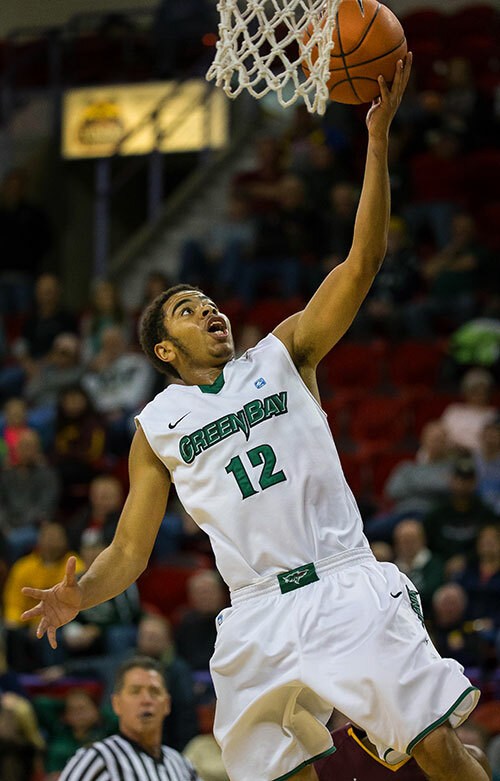 As the action comes to your end of the court the lens at 200mm is great for isolated player action. Under the basket at 200 things get a little tight and I missed a couple dunks due to being over lensed. The lens at 400 gives your plenty of reach to shoot coaching photos at the bench from across court. Nice zoom range to shoot bench activity. Nice tight shot with nice compression of a three point shot across court. This shot at 400mm tracked the action well as Green Bay Packers wide receiver Jordy Nelson pulled in a pass. I was easily able to flip in the 1.4 extender to catch this sack celebration by Minnesota Vikings defensive end Brian Robison . Shooting at F4 you have nice fall off in sharpness for the background so your shot pops. Another shot with the 1.4 extender at 560mm to capture Green Bay Packers quarterback Matt Flynn getting roughed up by Minnesota Vikings linebacker Audie Cole. This shot shows a little of the vignetting I wrote about when you shoot wide open with the extender. I was easily able to zoom to 200mm from the 400mm I was at when this pass came towards my end zone.